First edition of the German adaptation of A Sketch of Chinese History, Ancient and Modern. Edited by K. F. Neumann. Very scarce first edition of this magnificently illustrated six volume work on the famous places of Qing Dynasty China, with approximately 327 full-page woodblock prints (xylographic printing on mulberry paper) of which there are 135 double-page illustrations, 1 triple page illustration and three eight-page illustrations [a few of the maps being outlined in red ink]. Edited and illustrated by the Japanese artists Okada Gyokuzan, [1737-1812], Oka Yûgaku [1762-1833] and Ôhara Toya [1771-1840]. 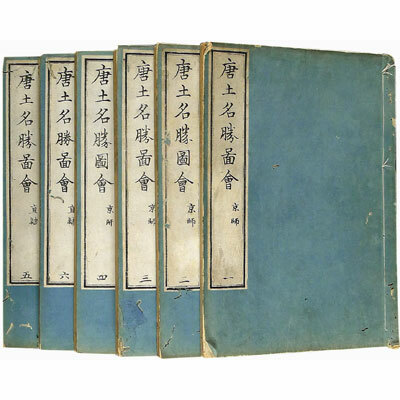 Text printed in Chinese and Japanese with Japanese reading marks, in original publishers blue wrappers. Housed in custom made navy morocco leather and cloth clamshell case, titled in gilt. The illustrations depict mostly topographical views: natural archaeological or sacred sites [the Four Sacred Mountains of Buddhism, monasteries] and palaces, or historical and legendary scenes based on classical literature. Specifically a map of China and Korea, a map of Peking, a plan of the the Forbidden City, a fine double-page plate depicting the astronomical observatory of Peking set up by the Jesuits Johann Adam Schall and Ferdinand Verbiest, maps and views of the Great Wall and its numerous gates. There are also views of buildings no longer extant, such as the Imperial Elephant Stables. In summary - Eleven 2-page maps, thirteen 2-page city plans, six 2-page temple plans, three 8-page scenery print, one 3-page scenery print, one-hundred and five 2-page scenery prints, thirty 1-page scenery prints, nineteen in-text prints, four pages of Chinese costume prints, two circular prints of Chinese dignitaries, one full page print of patterns, nine pages of prints of Chinese weapons, armour, and tents, four pages of prints of Chinese vessels and containers, five pages of prints of costumes and jewellery, ten pages of prints of musical instruments, two pages of prints of scales, nineteen pages of prints of modes of transport and accompanying banners and musicians, eight pages of prints of globes and other related instruments, a two page army schematic, four pages of prints of Chinese military costumes, two pages of elephant accessories, and numerous vignettes and samples of Chinese text. 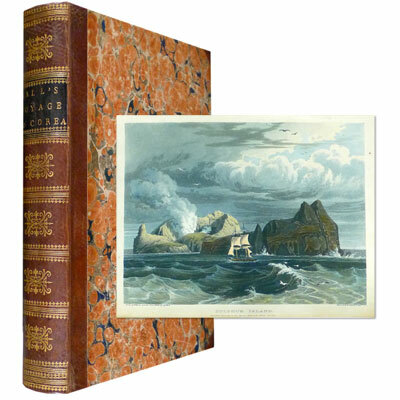 A fine full margined copy, with nine aquatint plates by William Havell, all but one hand-coloured, five engraved maps, including two folding, and an engraved plate of ‘Wollaston’s Dip Sector’ instrument. ‘This expedition took Lord Amherst's embassy to China and explored the relatively little-known East China Sea and the Yellow Sea. Visits were made to Korea and the Ryukyu Archipelago. Korea had been sketchily explored by Europeans, but it was not until this 1816-7 expedition of the Alceste and Lyra, under Captains Murray Maxwell and Basil Hall, that detailed information was obtained about the Ryukus. On the homeward passage, the Alceste was wrecked in Gaspar Strait off Sumatra. Captain Hall served in the Royal Navy from 1802-23 and achieved the rank of post-captain. He saw extensive duty on the Pacific coast of America, and continued his travels as a private citizen. He wrote many other books about his travels and experiences.’ - Hill. 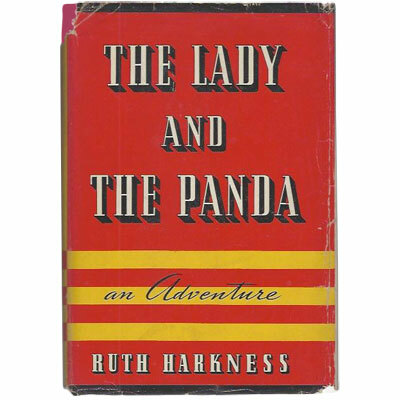 Wonderfully illustrated throughout with 16 pages of black and white photographs taken during Harkness’ journey and of panda, Su-Lin. 1931 - Privately Printed by George W. Jones at The Sign of The Dolphin in Gough Square, London - First Edition, Number 192 of 300 copies. Hodgson’s rare and important work – the first collected edition of papers on the literature and religion of Buddhism – fifteen in total, originally published in Transactions and Journal of the Asiatic Society of Bengal and London, and which for the first time revealed to the West the Sanskrit literature of northern, or Mahayana, Buddhism, which had been preserved in Nepal. For the collection Hodgson adds a preface and many footnotes. Features two folding lithographed alphabet tables. Interestingly, Hodgson published this book in Serampore, at the time a Danish colony, it would have been printed at the former Serampore Mission Press, set up by the Baptist missionary William Carey, which closed in 1837 merging with the Baptist Mission Press, where this copy was also bound (see small bookplate to front pastedown). Hodgson later reprinted 12 of the 15 papers as part one of Essays on the Languages, Literature and Religion of Nepal and Tibet (1874), the second part being on the tribes and geography of Nepal and Tibet, and in 1880 he published Miscellaneous Essays Relating to Indian Subjects (2 volumes, 1880), containing his papers on Indian languages and ethnology. A stunningly silk bound copy of this wonderful work, text in French, illustrated with seventy full page halftone photographic plates [with 140 photographs], 560 woodblock in-text engravings, ten full page woodblock plates, a full page plan comparing Peking through the ages, woodblock initials incorporating monuments of Peking, and 220 zincographic engravings of Chinese art [Zincography was a planographic printing process that used zinc plates]. This copy, in a variant binding of orange pictorial silk, is also one of a hundred copies that contained an additional eight full page hand water-coloured woodblock prints of nine porcelain works from the Louvre Museum [Opposite pages 460, 452, 412 , 404, 188, 180, 124, 116], water-coloured illustrated limitation page and extra illustrated title page, thirty water-coloured large initials with floral decoration.